In January, a lot of us dream of Florida’s sunny beaches. But for Floridians Kristian and Ingrid Yanez, a snowy Newfound Gap was their dream come true. 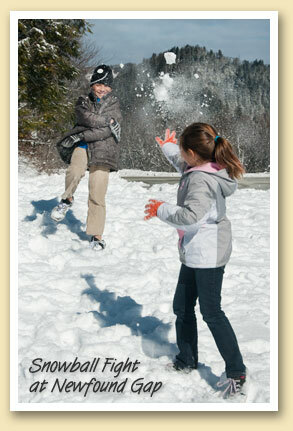 Even with Saturday morning’s chilling 17 degrees atop the Smokies, sibling rivalry is rarely this much fun. At 5046 feet elevation, Newfound Gap’s temperatures are usually 10º–15º cooler than Bryson City. And it receives much more precipitation, making it the best place to find snow. But before heading out, please check the road conditions. For updated road and weather information call the Great Smoky Mountains National Park at (865) 436-1200. Once you hear a voice, dial extension 631 for road information or extension 630 for a weather forecast. You can get that same information via the Internet by going to twitter.com/smokiesroadsnps to read recent road notification postings. This is a Twitter website maintained by the Park, but anybody can access it at any time without having to establish a Twitter account. The webpage is updated 3-4 times a week.